I recently wrote an article about the diagnosis and preventive treatment of migraine headaches. In that article, we discussed treatment of acute migraine headaches with acetaminophen, non-steroid anti-inflammatory drugs, triptans, antiemetics, and corticosteroids. We also spoke about when to initiate preventive therapy with medications such as amitriptyline, Depakote, beta blockers, topiramate, valproic acid, and Botox injections. All of the aforementioned medications can work great for prophylaxis of migraine headaches, however, in some patients, they just do not work, or they have adverse effects that cannot be tolerated. Today we will discuss the newest option for preventive treatment of migraines, which is Erenumab (Aimovig). This medication is approved as a once-monthly subcutaneous injection that works as a monoclonal antibody opposing the activity of calcitonin gene-related peptide (CGRP). Research has shown that levels of CGRP are elevated during acute migraine episodes, and in addition, studies showed that those that have been given an IV dose of calcitonin gene-related peptide have subsequently had migraine headaches. The dosage of Erenumab is recommended to be 70 mg subcutaneously injected monthly into the abdomen or thigh.Some patients may benefit from 140 mg once monthly (two subsequent injections of 70 mg) as well. One patient during the study who had significant risk factors for cardiovascular disease died from a cardiovascular event. As we talked about above, CGRP is a potent vasodilator, and by blocking this effect, it could theoretically lead to vasoconstriction, leading to an increased risk of a cardiovascular or cerebral ischemic event. 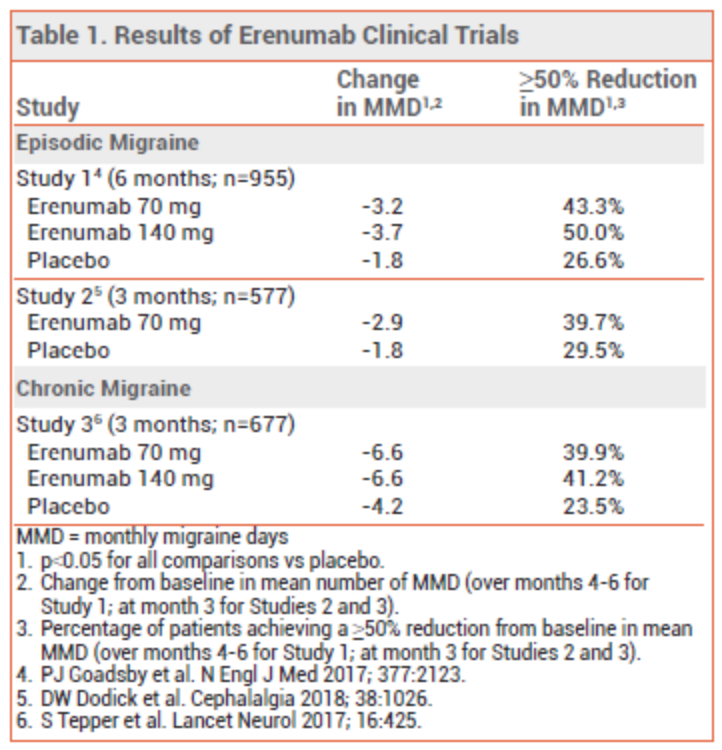 Overall, the novel medication Erenumab (Aimovig) has been shown through trials to reduce migraine headache frequency in those who suffer from episodic and chronic migraines. It also has been seen to be an alternative option for symptomatic relief in patients who may have failed several other options for prophylactic therapy. However, there is no current head to head studies available comparing Aimovig to other well-known options for prophylaxis of migraine headaches. The long-term safety will need to be accounted for as well, especially in those with a history or known risk factors of cardiovascular disease. If you enjoyed this article and would like to see more work such as this on novel medications, let us know! • The Medical Letter. 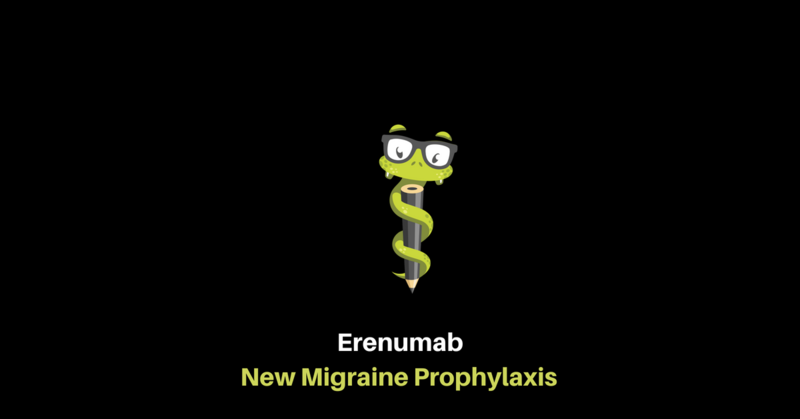 Erenumab (Aimovig) for Migraine Prevention. Volume 60. Accessed: June 13, 2018. • The Calgary Guide. Migraine Headaches. http:// calgaryguide.ucalgary.ca/migraines-and-auras-pathogenesis-and- clinical-findings/. Accessed: June 13, 2018.